It's Like There's a Starbucks on Every Corner! Today was a very busy day of touristy Seattle. I got a good 5 hours of sleep. We had gone to a club Tost last night and I had decided to leave later than I should have. But no worries because the rest of this trip is anti-social city! I woke up early in the morning to get a nice typical breakfast of eggs, hash browns and smoked salmon. I know I ate salmon for dinner last night too but it's just so darn good here. I took the Washington State Ferry to Bainbridge Island in Puget Sound. The ride was a very smooth half-hour trip, but I'm afraid it was so cloudy that the view wasn't that much to look at. I sat on the sun desk outside shivering trying to get good photo opportunities but it was cloud cloud cloudy. It is kind of of pretty in its own way and how I pictured the Northwest to look like - but I couldn't help but think about how much better the view would be if there was just a tiny blip of sunshine. Bainbridge was a very cute island. I did a casual waterfront hike but then it started to rain pretty hard. I am so glad I decided on an impulse purchase of a tiny umbrella before I came here because carrying that around in my bag has been extremely convenient. The island had a bunch of local artist stores and cafes and opportunities for kayaking on the water but because of the rain I didn't stay long. Upon arrival back in Seattle I stopped by the famous Pike Place Market - and it was as awesome as I imagined it would be. It's a maze to go through since there are so many levels, but on the main street entrance level there is a huge variety of giant fresh seafood in multiple stalls. I watched the workers behind the counter at Pike Place Fish Market waiting and waiting for the "flying fish" because the ratio of tourists to actual customers was like 20 to 1. Finally someone ordered something and the worker in front started throwing the fish from the front of the stall to the workers behind the counter. They were all so enthusiastic it was great. I walked around the rest of the market, which featured loads of local fruits, which all looked fantastic, and you can walk through all the stalls and they either have free samples out or they'll pick something up and start cutting it up so you can try a piece. They also had local goods and huge bouquets of flowers. I don't know how you can turn what is basically the concept of a giant grocery store into something with so much character, but it just felt very cool walking through there even though I had no intention of buying anything. 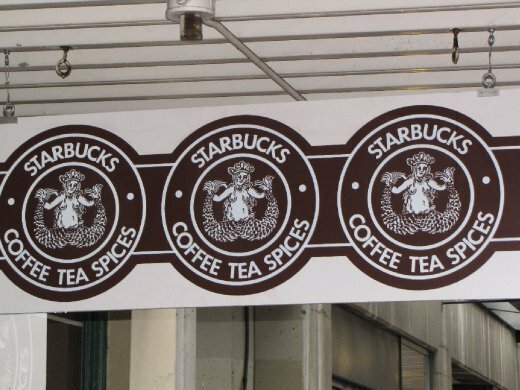 Pike Place Market also has loads of restaurants and cafes, including the first Starbucks, which still has the original racier version of the mermaid logo. I baptized my Starbucks gift card there today. =) No tables at all there - all takeaways - and the barristas were taking complicated long orders with no problems at all. Then when they were preparing the coffees, they were throwing the cups across to each other and the whole preparation process was completely seamless and extremely quick. The workers were also extremely energetic and cheerful even through I saw the queue constantly remain at 20+ people over 45 minutes. It was a little bit unsettling how they can keep their energy up. Finally at the end of the day I headed to the Seattle Center to check out the Space Needle and go up to the Observation Deck. The night view was gorgeous of course and the outside deck was very cold as expected. I'll have to make a return trip tomorrow to check out the Experience Music Project/Science Fiction Museum - because that has my name all over it. Chilling in my hotel room is nice. I kind of wistfully regretted not staying in a hostel because I always meet some interesting people and it's nice to share stories, but I'm very much starting to like my panoramic view of downtown from the 42nd floor (even without the Space Needle). I feel like Frasier. And even though I've only spent 1 day walking around the city, I think I'm already starting to get the hang of it. The buses are free within a certain area, but for me the area's too small to be efficient and plus I really wanted to get out and see everything. But of course now my legs are killing me and I'm exhausted and my voice is still kind of shot from yesterday. Still worth it! Tomorrow looks like it'll be the best weather I've seen so far - mostly cloudy. I swear if I didn't know that Mt. Rainier was nearby, I would have no idea that there's supposed to be a mountain in the backdrop somewhere. I want your itinerary when you get back!